Koh Rong after dark provides numerous opportunities for a hangover. Luckily they sell detox tea elsewhere on the island. Skybar is situated at the top of a towering climb of stone stairs, but the lovely view is worth the climb. Skybar has different drink deals each night, along with a happy hour every evening from 6 p.m. Read our full review of Koh Rong Skybar for more info. 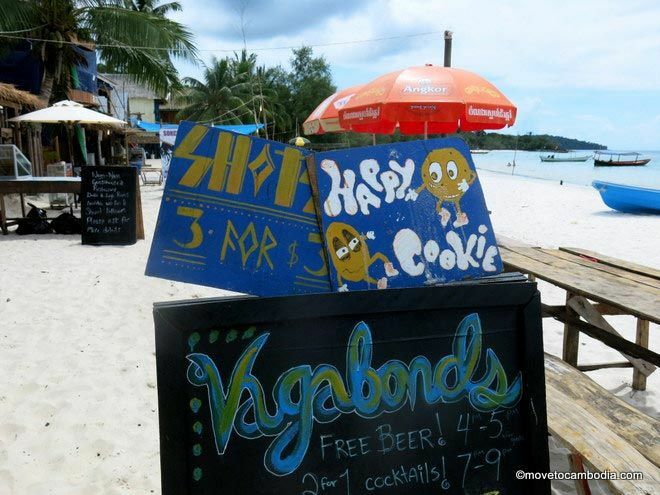 Vagabonds is a stoner hangout in Koh Toch Beach that offers cheap drinks, a laid-back vibe, and lots of dreadlocks. They even host a free-beer happy hour, which defies the laws of finance, but who are we to question the economics of having a good time? Happy cookies and the like are sold here. Island Boys is another backpacker favorite, with a two-for-one cocktail happy hour and themed party nights. If you rent a room there, you’re entitled to a free-beer happy hour. Watch our for the flying darts. Bong’s is a favorite with Koh Rong expats and long-term visitors. They offer great value boozing, with two happy hours every day, from 12 to 2 p.m. and again from 4 to 8 p.m. The happiness includes $0.75 draft beer, spirits and mixers for $2, shots for $1, and cocktails for $2.50. The soundtrack is mostly classic Britpop and British indie tunes (a nice change from the psy-trance and Top 40 elsewhere on the island), and the friendly owners, Jake and Karen, make Bong’s a pleasant spot for a drink. Paradise Bungalows has the best wine selection on the island, and if you’re looking for something a bit more sedate (and dare I say, adult) than the backpacker joints, this is the place to go. Their restaurant and bar have beautiful views so it’s a nice place to start your evening with a sundowner. 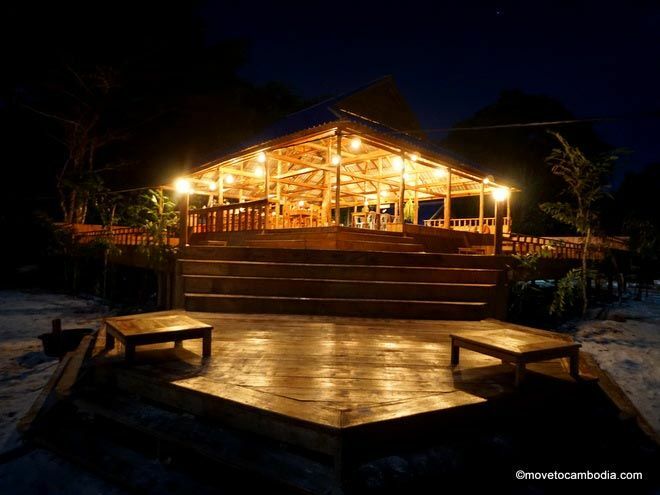 Koh Rong after dark offers opportunities to party the night away. Monkey Island has a happy hour two-for-one cocktail special from 6 p.m. to 9 p.m. The drinks are strong to begin with, so if you’re looking to get drunk before dinnertime, this is the way to do it. 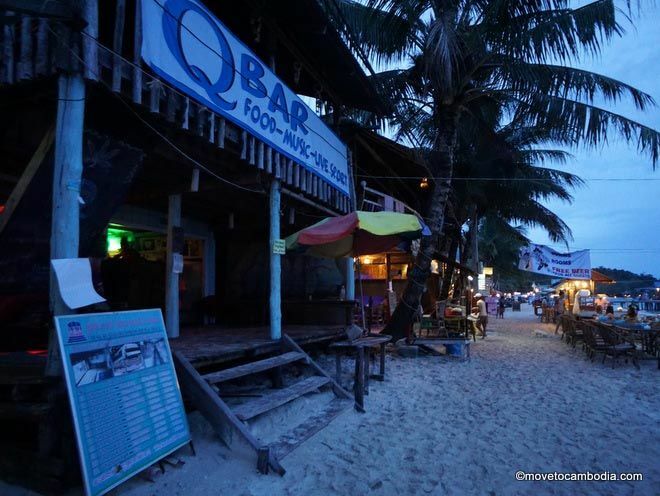 The drinks are cheap and the bar is popular, but these days they usually close down by midnight, when the crowds tend to move closer to Koh Toch Village. Rising from the ashes of the late, infamous Mango Lounge, Q Bar is the newest incarnation under new ownership. They’ve kept the formula the same: a dark, bare room reminiscent of a squat with live DJs every night of the week playing trance and minimal, and drugs sold over the counter. The Dragon Den Pub is Koh Rong’s first serious bar. What do we mean when we say serious? While most bars on Koh Rong restrict themselves to serving cheap Klang beer and buckets of toxic Mekong whiskey, Dragon Den boasts the largest selection of beer on Koh Rong, including imported wheat beers and Five Men Fresh Beer — a very nice beer brewed in Sihanoukville — on tap for just $1. Best of all, they have their own microbrew creations. Every Tuesday and Friday there’s a Koh Rong pub crawl led by infamous island dweller Richie Rich. The pub crawl leaves from Sky Bar on Tuesdays and Monkey Island on Fridays at 8 p.m. Tickets cost $8 in advance (and can be purchased online or at any of the stops) or $10 at the door. Participants get a free T-shirt, shots, and the chance to drunkenly traipse around Koh Rong getting hammered. The crawl’s impresarios advertise flip cup, beer pong, and hot staff, plus free shots at every stop. There’s a new competing ‘pub hop’ on Tuesdays that draws a smaller crowd. On Wednesdays and Saturdays there’s an all-night party on Police Beach with a fully stocked bar and a soundtrack of techno, drum and bass, and deep house. The party lasts as long as you do — they keep going until it’s the last man standing. Admission is $5 in advance or $7.50 at the door, but the price will probably rise in the high season. Full moon parties are held in the same location. Nest is Long Set Beach’s most beautiful place for a drink. Over on Long Set Beach, Nest is gorgeous bar and restaurant offering stunning views of the turquoise waters of Koh Rong. They have a happy hour from 6 to 9 p.m. with two cocktails for $5. Nest has a seriously chilled-out vibe, with eclectic tunes ranging from soul to jazz. Ambient lighting, lovely architecture, and bar or lounge seating make the place a pretty place to stop for a drink. They also host sporadic parties, that offer a round-trip boat ticket from Monkey Island, a free beer, free tank top for the first 100 people, and free shots, all for $4. Parties feature live DJs and a hog roast, plus entertainment including fire spinning, face painting, and drinking games. Ask at Nest for upcoming dates. Open daily, 9:30 a.m. to 2 a.m.